New integrated website combines research and packaging products with interactive features to assist users in finding exactly the solution they need for creating, storing, managing and packaging their chemical and biological samples. WHEATON, the company that designs and delivers today’s most innovative solutions for the laboratory research, diagnostic packaging and specialty pharmaceuticals industries, proudly announces the launch of its new integrated website, http://www.WHEATON.com. 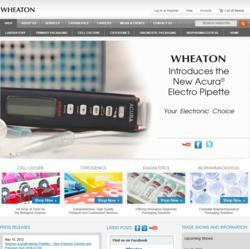 Visitors to this web address will find all the products and expert capabilities that WHEATON presented on two former websites, wheatonsci.com and wheatonpkg.com, combined in one, unique new web community. The site’s sleek user interface supports faster navigation, improved product searchability, and a more streamlined transactional experience. WHEATON is setting a new standard for user friendliness and interactivity with this website. Visitors find exactly the right product for their specific needs in developing and commercializing therapeutic products. The site delivers value to visitors by presenting enriched product information, including product drawings, technical data and application guidance. As a platform for new media, the site provides access to videos, slide shows, graphic presentations and links to WHEATON educational blogs such as CryoFeed (http://www.cryofeed.com), the innovative WHEATON microsite dedicated to biobanking and life science cryopreservation. Interactive features such as polls and forums promote visitor participation. For sharing and commenting on site content, links are provided to Twitter, Facebook, LinkedIn and Google+. Continually updated social media posts and downloadable content ensure a memorable web experience, especially for scientists who devote their careers to science. “Scientists invest everything in their work; their time, energy, enthusiasm and creativity,” remarked Stephen R. Drozdow, president of WHEATON on the new website. “The goal we set for ourselves with this new website is to give them a community-like experience in which scientists can participate, learn and interact with us and other scientists to make the most of their important work,” he added. The WHEATON website is live and viewable on the web at http://www.WHEATON.com. For additional information or to speak with someone at WHEATON, please call 800.225.1437 in the USA, or 856.825.1100 for international callers. WHEATON admires those people who devote their life to science. It’s this admiration that drives us to design and deliver today’s most innovative solutions for the laboratory research, diagnostic packaging and specialty pharmaceuticals industries. It’s this admiration that motivates us to offer the best customer service experience and most dependable products in the industry. And, it’s with admiration that we stand behind those people who help move the world forward one discovery, one sample at a time. The WHEATON name means more than a legacy of the highest quality products and services; it stands for a commitment to honor the effort of all scientists... because it’s their life’s work.